Home builders usually place a handful of receptacles on the outside walls of any house. Unfortunately, they aren't always located in the best places. You can make them work with long extension cords, but it makes more sense—especially from a safety point of view—to install receptacles where they'll be most convenient. The job is easy for an experienced DIYer and doesn't require uncommon tools. The most important part is to make sure you insulate carefully around the new boxes to prevent heat loss. Define what the receptacle will be used for and map out its ideal spot using masking tape on the outside of the house. If you know that you want multiple new receptacles, install all of them at one time. Typically, the receptacle should be located on the first floor, near the ground. If the building doesn't have a basement to access supply wires, then exterior surface wiring is usually required. If that's the case, hire an electrician to install the receptacle for you. You'll need a ground-fault breaker in the service panel that protects all the outlets on the circuit, or an individual ground-fault breaker built into each receptacle. The new electrical box should be specified as an "outdoor box." This box has sealed seams and foam gaskets to keep out water. Its cover plate should have one (or two, depending on the design) sealed flaps that cover the receptacle openings. You'll also need a 12/2 weight gauge (with ground) cable to connect the new box with the existing circuit. Don't forget to have a can of nonexpanding spray foam insulation on hand, which will ensure a tight seal for your receptacle and stop air leaks. 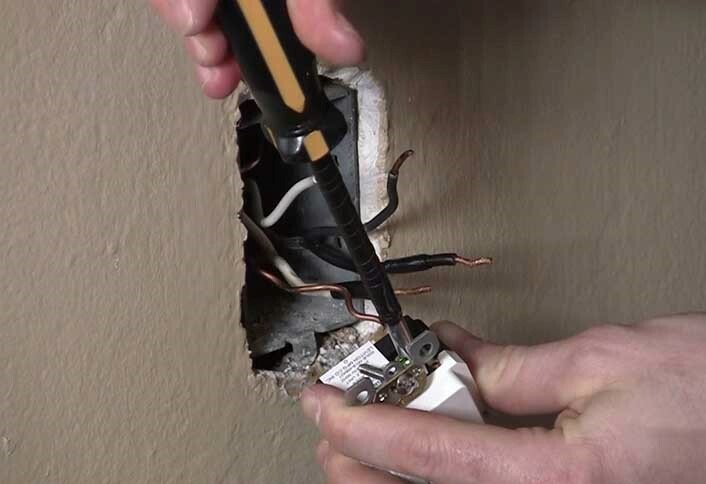 A small amount of fiberglass batting will also help properly insulate the receptacle. Add it to the circuit that carries other outdoor receptacles. 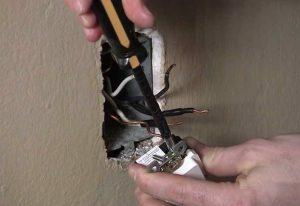 Patch into the power that serves the interior receptacles and install an exterior-grade ground-fault receptacle in the new box. 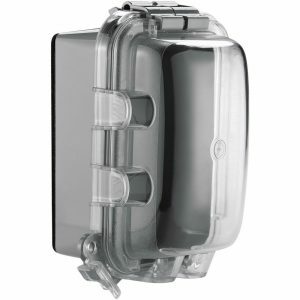 This protects the new receptacle and makes accessing power much easier. To find the power source, locate the room receptacle inside the house that's closest to where you want to place the outdoor unit. If possible, install the new box directly behind the interior box. Turn off the power to the circuit that serves this outlet at the service panel. Double-check that the power is off using a current tester. 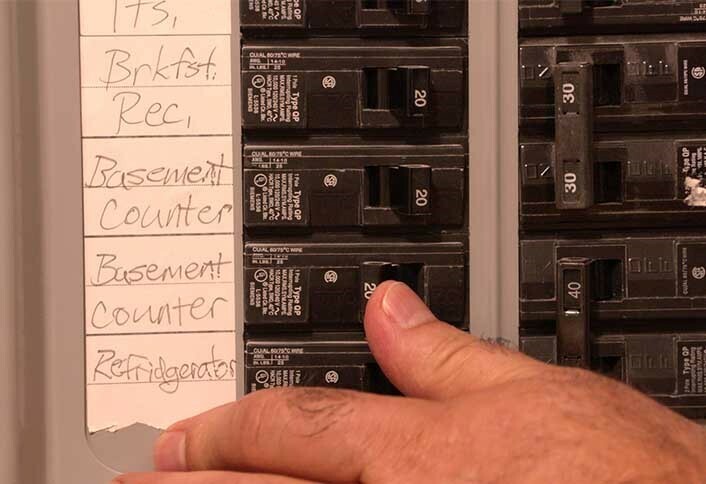 Turn off power to the indoor receptacle at the service panel. Use a small-diameter drill bit (at least 12 inches long) to drill a hole alongside the interior receptacle box and out through the exterior siding. This makes a reliable reference point for locating the exterior box. 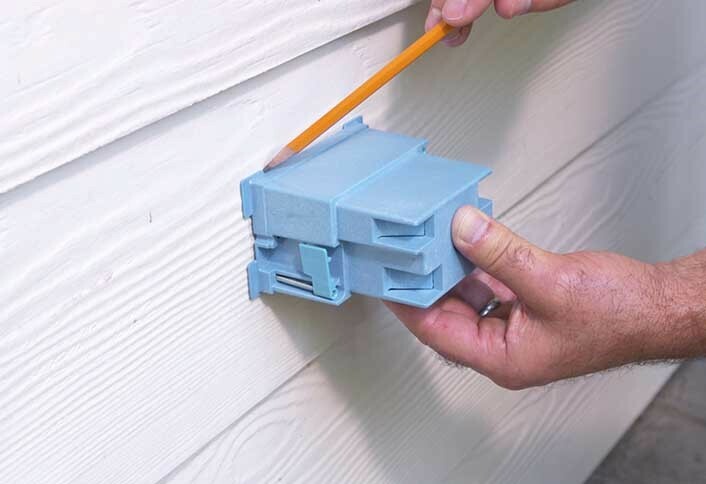 Take the new box outside, press it against the siding, and trace around it. Drill a starting hole in one corner of the box outline, then cut out the siding and sheathing with a saber saw or jigsaw. Getting the electrical cables from the interior to the exterior box can be difficult. The best approach is to attach two-foot-long cables to both sides of the exterior ground-fault receptacle. Slide these cables through the back of the exterior box, but don't install it yet. Guide the other end of the cables into access holes in the back, bottom, side, or top of the interior box. Push aside any existing insulation to accomplish this. Establish a location and trace the box onto the siding. Return to the outside and add insulation between the back of the interior and exterior boxes. Fiberglass insulation is best because it fits easily around odd shapes. Push the box into its opening, nail or screw it to the side of the stud, and install the ground-fault receptacle in the box. Go inside and pull the excess cable into the interior box, cut it to length, and attach the white wires to the white wires inside the box with proper-sized wire connectors. Do the same with the black wires. 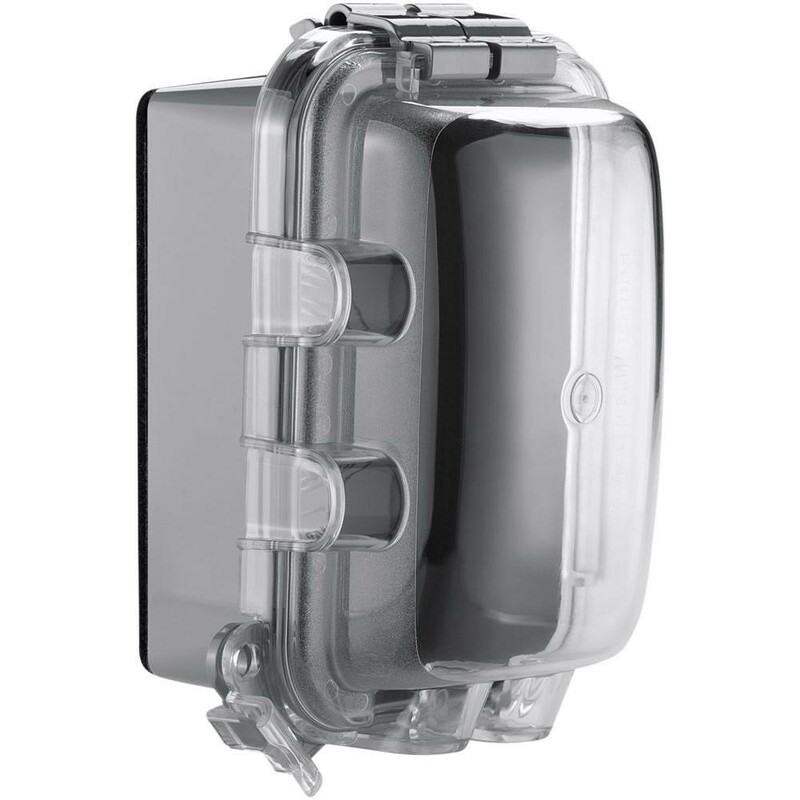 Join outdoor wires to those on the back of the indoor receptacle. Finish up by spraying nonexpanding foam insulation around the interior and the exterior box. Add the cover plates for both, turn on the power at the service panel, and check that the ground-fault switch on the outside receptacle works properly. 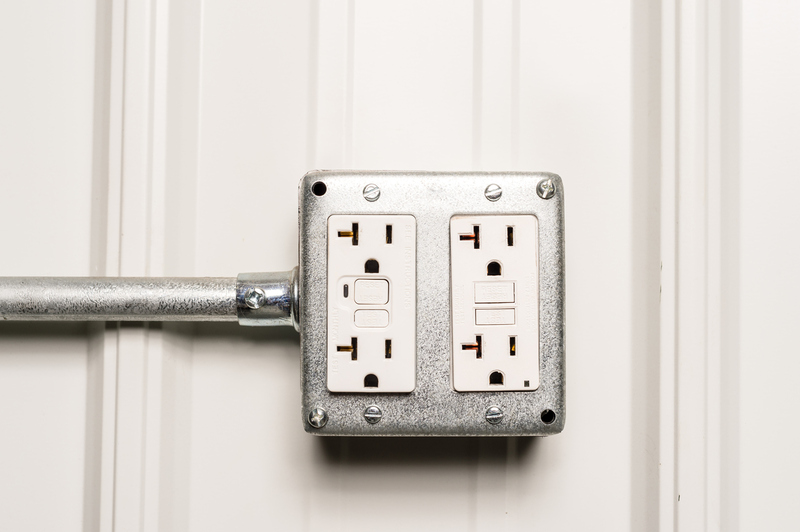 Having an additional outdoor receptacle in a convenient place will help you take care of chores around the house while avoiding the safety concerns created by long extension cords or overloading indoor circuits. Steve Willson writes for The Home Depot. 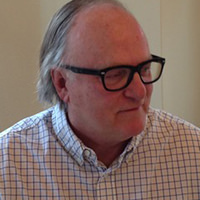 He was the home improvement editor for Popular Mechanics magazine for 22 years and owned a carpentry contracting business in New York. He has also written three books about home improvement. You can learn more about insulation materials by visiting The Home Depot's website. Are Shipping Containers the Future of Swimming Pools?